Tweaks that hook into the music-playing aspects of a jailbroken iOS device seem hot property at the minute, with a few hitting Cydia in the last day or so. PodControl is one a number of music-orientated tweaks that have landed in Cydia, with its sole purpose being; to give users a quicker, more efficient way of playing and flicking through their music library. By default, iOS provides music controls in the multitasking switcher tray which can be accessed by double pressing the Home button and then swiping through the views to get to the controls, not exactly quick access by any stretch of the imagination. 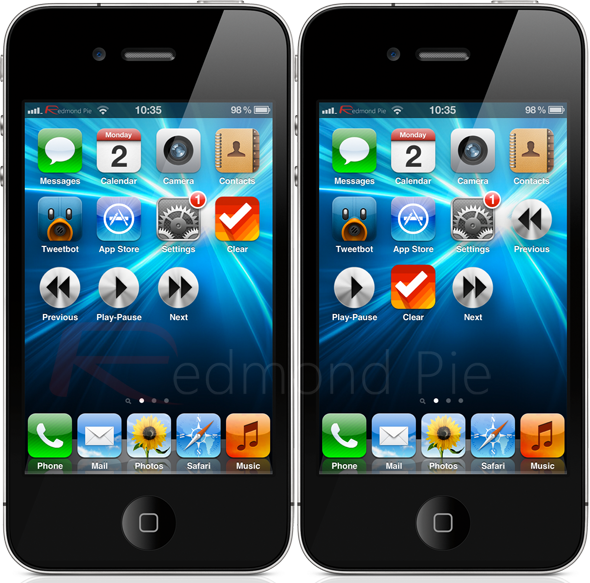 After installation, PodControl makes use of the device’s home screen by placing three little media player icons on the home screen that look, act and feel just like standard app icons. The icons consist of a very familiar looking play and pause button as well as a previous and next button that allows flicking through the music library on the device. One of the great things about PodControl is that the media player buttons that it adds are entirely editable, meaning that when the device is in edit mode (holding down on an app icon until they wiggle), they can be rearranged just like any other app and can be placed anywhere on one of the various home screens. Users who install PodControl will be doing so purely for the convenience of being able to choose where the buttons should be which control their Music app. The tweak itself doesn’t offer any functionality that doesn’t already exist on the device as standard, it just offers that service in a different manner which will be useful to a number of people. PodControl also works extremely well with the recent MediaSpeak tweak that is available through Cydia. 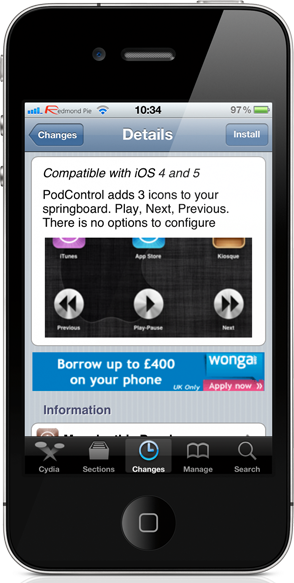 PodControl is available from the BigBoss repository as a free of charge installation and requires iOS 4.0 or above.